We’ve all met the guy who lives on the right side of this plot. He speaks with full assurance that he knows what he is talking about. He feels it necessary to tell us about why there is no reason to doubt him or question him. He’s got this in the bag. We want to believe him, because it’s easier. But the need to go on and on, typically reveals his own insecurities about what he can do. 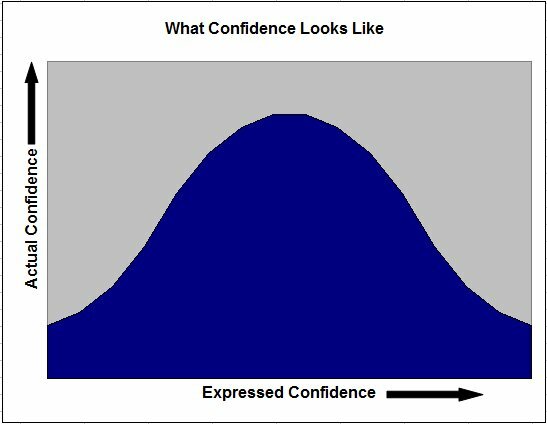 True confidence does not need a lot of expression. Sometimes it even expresses doubt. A truly confident person considers feedback and doesn’t need the façade of always being right. So the next time we hear someone bragging or dismissing criticism out of hand, remember that they are probably feeling very insecure themselves.